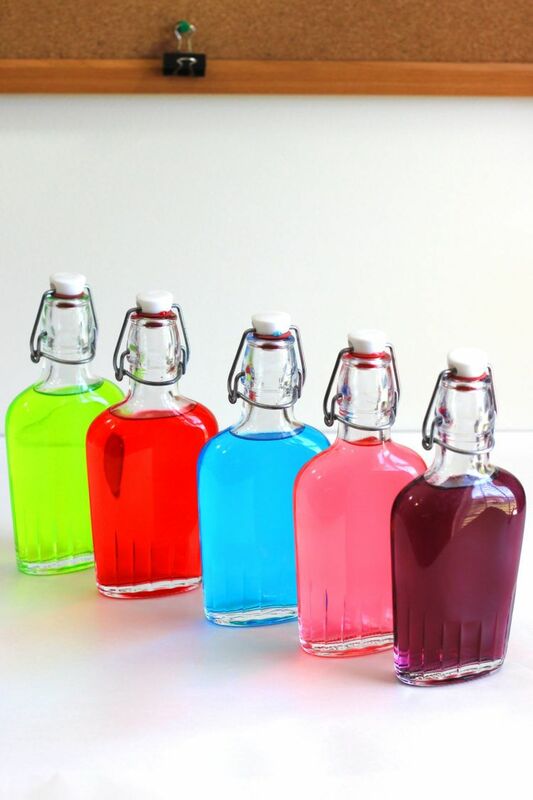 It’s time again for childhood and adulthood to collide in a most delicious way with Jolly Rancher Vodka! 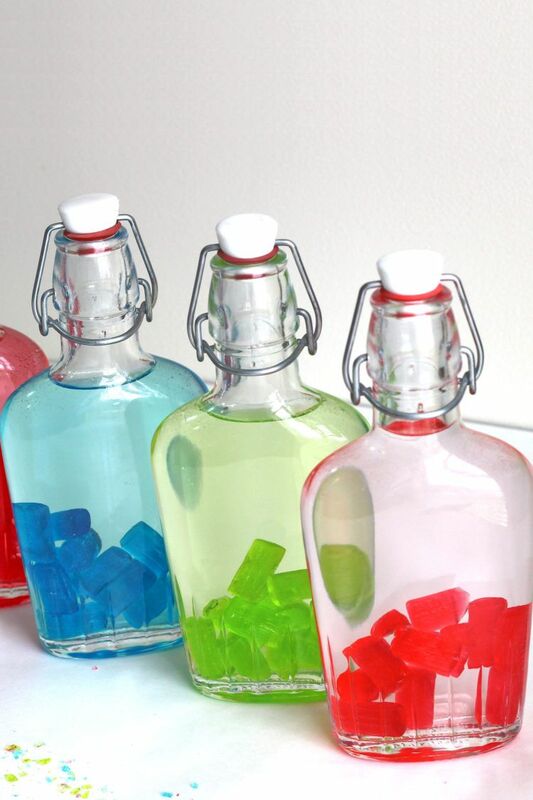 You make this delicious drink by infusing vodka with Jolly Rancher candies, much the same way we make Skittles Vodka or Starburst Vodka. 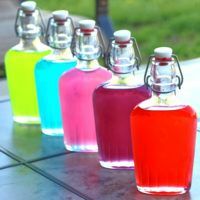 And Jolly Rancher Vodka is much easier to make than those others, and the results are fabulous. It’s tasty and gorgeous to look at. 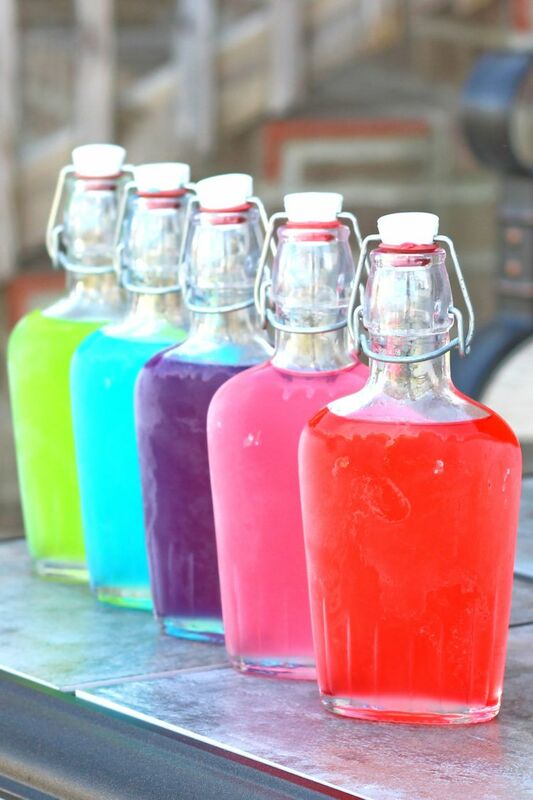 You can whip up batches of five Jolly Ranchers Vodka flavors in only twelve to fourteen hours. It takes very little work on your part, so they make wonderful, affordable, memorable gifts, too. And we’ve got more ideas for cocktail gifts here, too. Jolly Ranchers. 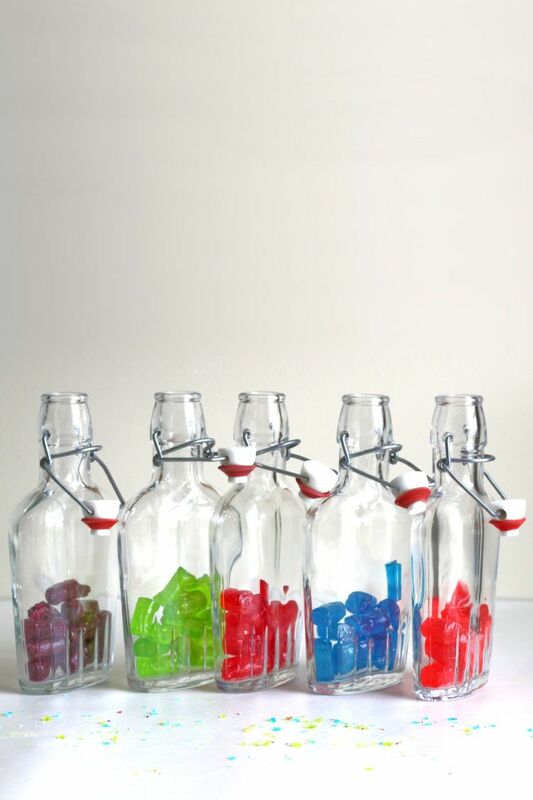 You need 12 Jolly ranchers in each flavor you want to infuse (that’s 60 Jolly ranchers altogether). This 48 ounce bag will have more than enough. Five flasks to pour it in. You can buy these gorgeous 8 ounce Bormioli Rocco flasks you see in most of the pictures on this page. Funnel to help you pour the vodka into the narrow necks on the flasks. Optional: a plastic sheet or newspaper to cover your counter, because little bits of Jolly Rancher candy fall out of the wrappers and stick to everything. That’s grape, green apple and watermelon at the top with cherry and blue raspberry in front. As you can see, you don’t necessarily get equal numbers of every flavor in an assortment bag. This bag had more of the grape than any other flavor, and less of blue raspberry. But even with the blue raspberry, there was more than enough to do the whole experiment twice. 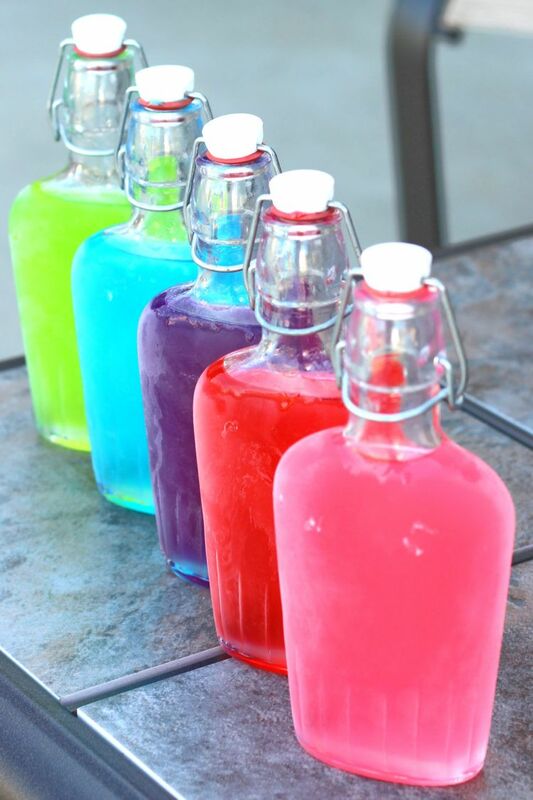 Put twelve Jolly Ranchers of each flavor into each flask. Yes, you can put them directly into the flask instead of into a mixing container. The reason? Because you’re not going to have to skim anything out of it, like you do with waxy candies like Skittles. Every bit of the Jolly Ranchers – which are mostly corn syrup, sugar, flavorings and colors – belongs in the final product here. And that’s why Jolly Rancher Vodka is so much easier than a lot of candy infusions. 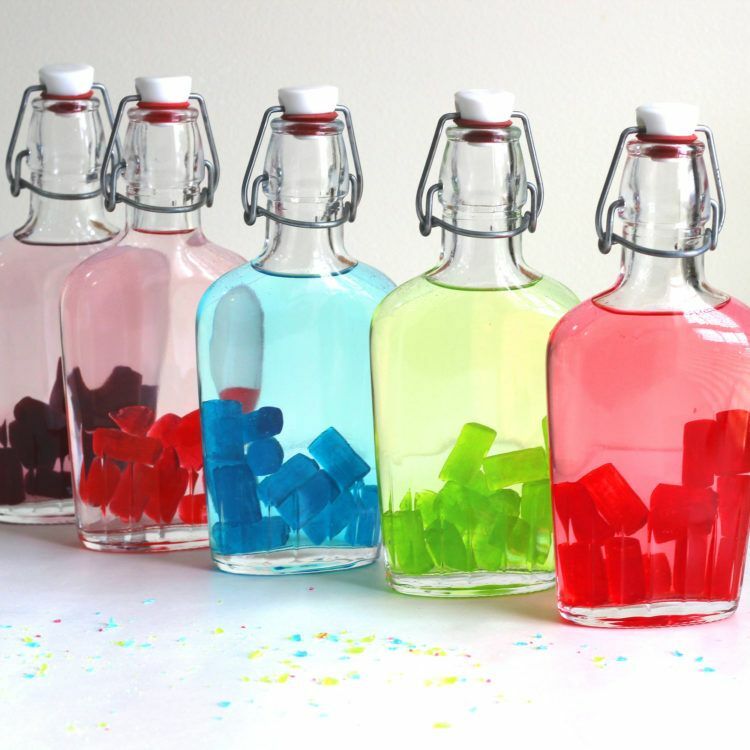 Once you’re done, you should have five flasks with beautiful colored candies in the bottom. 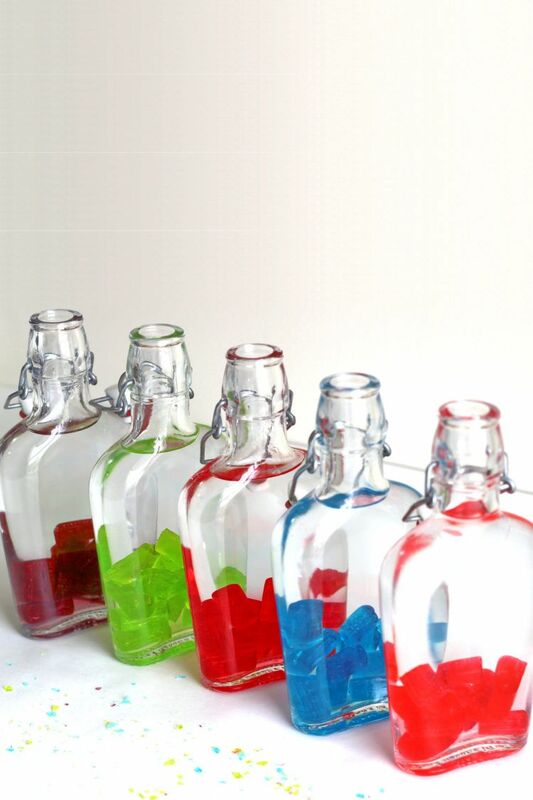 Next, pour the vodka into the flasks over the candies. Stick a funnel (optional) into the neck of each flask, and pour your vodka down it. I filled mine to the top of the neck. As you can see, they start taking on the color of the vodka immediately, as it starts breaking down the candies. There’s no need to shake them. Just let them sit for about eight to twelve hours, and all the candy will dissolve completely with no mess, and nothing stuck to the glass. I’ve also tried it with shaking, and it took the same amount of time. You can shake if you want to, but it doesn’t make any difference. It was a pleasant surprise to see how different the colors of the watermelon and cherry came out. The candies look almost the same shade of red. But with the infused vodka, they look nothing alike. As the picture here shows, the cherry is a nice deep red and the watermelon comes out a lighter red – sort of a coral, or a cross between pink and orange. Even next to each other, they don’t look like the same color. Put your flasks into the freezer and let them chill for a couple of hours. Now they’re really ready for drinking or mixing into cocktails. What you have in your flasks now is nearly pure vodka, so they’re very strong on the alcohol. The flavors are exactly what you’d expect. At first, you just taste the Jolly Ranchers in liquid form, exactly like the candies always tasted. Then the vodka hits you with its characteristic flavorless burn. You can definitely drink these straight up as flavored martinis or shooters, and they’re a lot of fun. But you can also mix them into cocktails – more on that in a minute. We’ve had a lot of questions about how long these will keep. We don’t know a scientific way to test that, and we’re not qualified anyway. But we’ve stored them as long as 25 days in the fridge, and there was no change in taste or color and they didn’t make anybody sick. So we would suggest making them two weeks in advance or less, just to be safe. Make a Raspberry Kamikaze with Blue Raspberry Jolly Rancher Vodka in place of the Chambord. You’ll end up with a blue cocktail instead of a deep red one, but the taste is very similar and really good. Replace the vodka in a Tokyo Iced Tea with Apple Jolly Rancher Vodka. It’ll go nicely with the kiwi liqueur. Try a Grape Russian Tea with Grape Jolly Ranchers Vodka instead of the grape schnapps. Replace the grenadine in a German Cherry Bomb with Cherry Jolly Rancher Vodka. It makes for a chocolate covered cherry sort of flavor. Make a Love Bite with Cherry Jolly Rancher Vodka in place of cherry liqueur. But note that the Jolly Rancher vodka will float on top of the other layers instead of at the bottom. Make a Laffy Taffy, but with Watermelon, Apple and Raspberry Jolly Rancher Vodka instead of the schnapps and DeKuypers the recipe calls for. Mix any of the flavors with some mineral/soda water or 7-up or Sprite. A touch of Rose’s Lime contrasts nicely with the Watermelon, Grape, Blue Raspberry or Cherry. You can definitely serve these over ice or simply water them down a little if the straight vodka’s too strong, but you don’t want to dilute the flavor with another flavor. 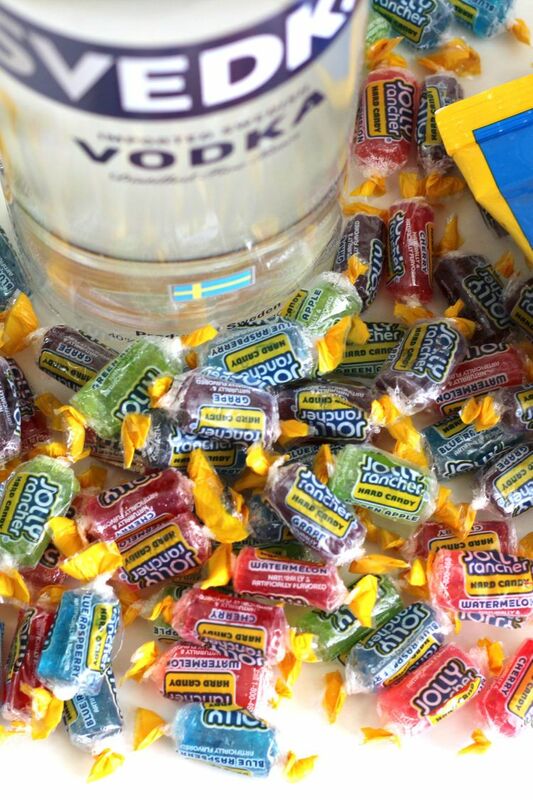 It's so easy to infuse vodka with delicious Jolly Rancher candies, and only takes 12-24 hours. After 24 hours, the infusion is done. Chill in the freezer for a couple of hours, if desired. Does anyone know any other hard candies that this would work with? We don’t have Jolly Rangers in Australia but I really want to try this because it looks so easy and good for parties. Thanks! Short answer: Does it contain anything that can’t be filtered out? No? Then you can probably use it. Skittles and Starburst are also featured on this site, and between the three they kind of cover all the bases on different kinds of sweets. It will work with any hard candy. Most hard candies are basically just sugar, something like corn syrup, and flavor. 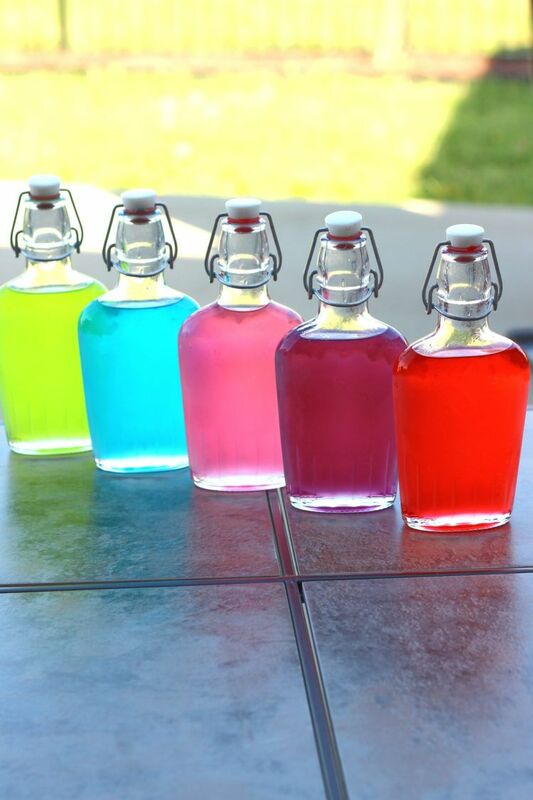 If it has additional ingredients, you could find you need to strain it a little, like Skittles Vodka only not that much, but it will work. I’ve stored them for about 25 days in the refrigerator. I would think even outside the refrigerator, they should last as long as the candies themselves would, which is years, but I don’t want to test that, LOL. I have tried to do jolly rancher moonshine and why did my jollyranchers never resolve? I’ve never tried to do them in moonshine, but I would have thought it would work (I’ve done candy corn in moonshine and it dissolved nicely). A couple of people in the comments had trouble with certain brands of vodka (or candy), but we’re not sure why. Sorry, wish I had a definite answer for you. Are they close to finished? I’ve had them take 20 hours before. Keep shaking them. But if they’re not even close, I have heard that putting them in the dishwasher while you’re running it helps. I haven’t tried that, but I read it from somebody else. does it need to be in glass? or could you use a plastic water bottle? Some people say it does okay in plastic, but others say it can get a weird taste. I’ve never tried it in plastic. Can you keep them in the freezer or do they need be be refrigerated? I would prefer to sore them higher if possible so the little ones don’t think it’s a fruit drink. I have always kept them in the freezer with no problem. I think the fridge would also be fine – it’s not like they have ingredients that are likely to spoil anytime soon (look at the expiration dates on the candy bags to get an idea how long this stuff can last). Obviously, whatever keeps them from the kids is your best option! If you’re asking whether you can just not refrigerate them at all, I haven’t tested that myself, but I would bet you can. Like I said above, look at the expiration date on your candies. The alcohol is a preservative, so they should last a long time in a cabinet. Can you mix the flavours? So like put watermelon and cherry in together? Can you recommend any flavored vodkas to use? Any of them that sound like a match. Cake and whipped cream vodkas are fairly neutral and add some sweetness. But you can also do a watermelon infusion with, say, a lime vodka, and it’s like a watermelon lime cocktail. I laughed a little bit because for most of my adult life, I’ve been drinking two of those 1.75L bottles of Svedka every week (high alcohol tolerance, had to drink that much to just barely feel it). Now I drink one of those larger bottles in 10 days and I’m doing much better with it, thanks to Zoloft which, in addition to treating depression, significantly lowers a patient’s alcohol tolerance. It’s a lot healthier for me and I’m grateful for it. That said! I bought a bag of Jolly Ranchers just for the cherry and grape ones, which I love, and then I had all these apple and watermelon ones I don’t like in usual form. In vodka form, they’re pretty good! I already drink vodka tonics almost exclusively due to how cheap it is, but this is a fun way to mix it up (no pun intended). I won’t eat the blue ones, though, I hate them (like pure sweetness, not tart–utterly pointless in my opinion, even though blue is my favorite color). My second favorite Jolly Rancher flavor after cherry is actually lemon and you can’t buy them in the assorted bags anymore. They are the cheapest ones to buy in bulk, though. 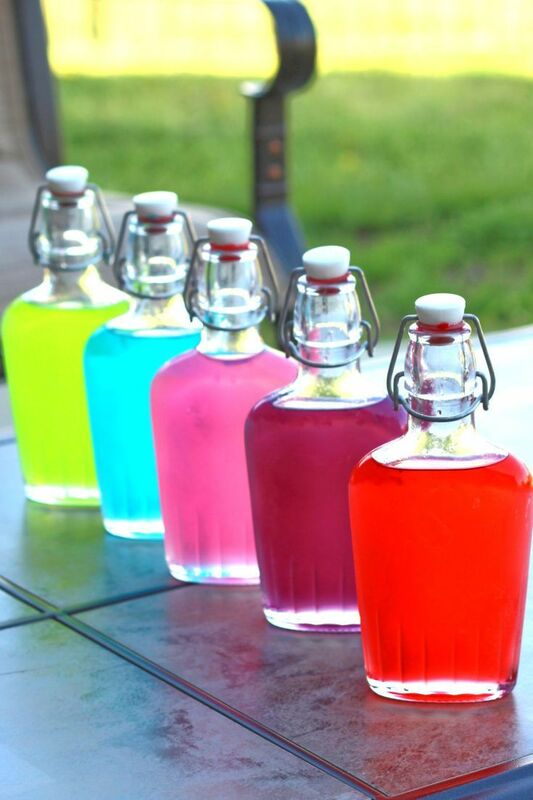 I’m going to make Jolly Rancher lemonade vodka when I order a bulk bag on payday. Very excited to try it. I only wish there was an affordable option to buy all cherry ones! They mix up faster if you stick them in the dishwasher while you’re doing other dishes. Do you think this could work with sugar free jolly ranchers as well? I don’t have time to order any 8oz bottles and my nearby Walmart only sells 16oz and higher bottles. For the 16oz bottle does this mean I just use twice as much jolly ranchers in the recipe? I think that will work! And if you have Amazon prime, sometimes they will do same day shipping on these, if you click my link and then look around at different sellers. Quick question… Do you let it sit on the counter or put it in the fridge while the candies are dissolving? On the counter! No need to refrigerate it until you’re done, and even then it’s optional. Have you tried this with other candies, like Werthers? I have, and it works! Also candy canes and any other hard candy. So I tried this and the alcohol is still pretty strong, but has a decent smell to it. Should I add more jollies to counter the strong taste? Would that work? Sounds like it should. Let me know how it turns out! 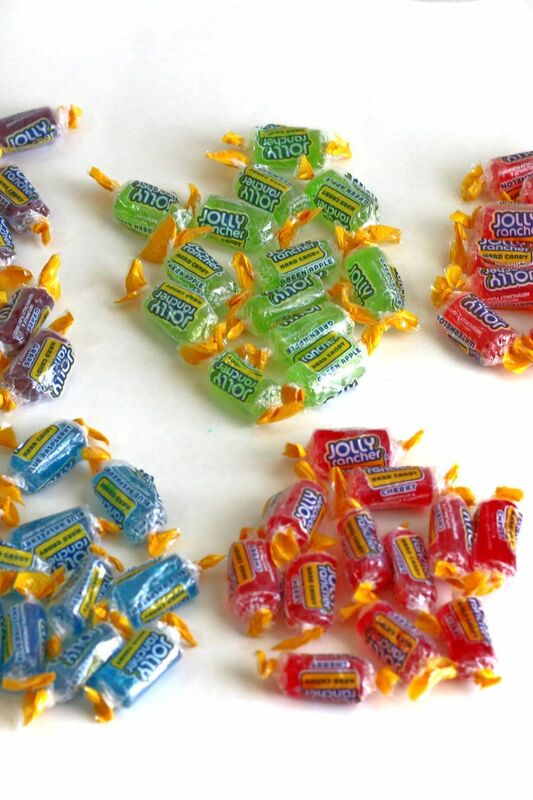 Would adding 18 or 24 jolly ranchers be too much? I don’t think so. If you try it and it ends up syrupy or too intense, you could just add more vodka. Two days later jolly ranchers still not dissolved. You can also put them in a saucepan with a Lil juice or water and dissolve them then add to jar then add vodka shake and it’s the same.